Autumn is here and boy, it’s here with a vengeance. Rain is dripping off our over-laden pear tree and the sky is glowering, heavily gray. I’m not usually a dessert kinda guy, but this calls for some sort of pick-me-up. Something involving those pears and the mountain of home-grown apples from the in-laws’. I love home grown fruit, much much more than the technicolour, perfectly proportioned but anaemic bimbo stuff in the supermarkets. Even more than the more earthy knobbly and flavourful types you find in farmers markets. No apple tastes as good as one plucked fresh from the branch. Cliched, but true. Since I got a Magimix, and so no longer have to rub flour and butter into crumbs by hand (a wearying task at the best of times), this is one of my favourite recipes. So quick, so tasty, so wickedly, butterily (is that even a word? ), caramelely good. It’s inspiring a slew of new adjectives. I like to mix apples and pears, so it’s not, strictly speaking, a tarte tatin. It’s a tarte something else, not sure what. Meh, who cares? It didn’t last long enough to worry about. This is the sort of thing that looks even better when it’s a bit rough round the edges too, a bit rustic. My kinda dish. What you end up with is a deeply mellow and earthily sweet tarte. The rich caramel balanced by the acidity of the fruit (which is why I prefer dessert apples over cooking ones, the latter just kinda disappear) and lifted by the citrussy zing of the lemon. Serve it with a tangy but creamy Greek yoghurt and you have a dessert that won’t leave people gasping for a bitter coffee because they’re too riched out. And so goes with pretty much any dinner. This recipe is pretty much faithfully reproduced from Leigh’s Cookery Bible, except I don’t have any rice flour, so used all plain flour. And I prefer to use demerara sugar over plain granulated, it gives it more of a heavy, savoury-sweet flavour. Oh yes, I use dessert apples and pears, not cooking apples. So actually, it’s not faithful at all, but it is based on the Leigh’s one. That’s because, to my cost, I’ve learnt not to mess with baking quantities much. Sift the flour into the bowl, add the butter and rub together with your fingers until it crumbs. Or, if you’re lazy, whack it in the magimix, making sure you have right mixing attachment, and blitz to crumbs. So much quicker. Add sugar and beaten egg and mix together until the pastry binds into a yellow ball. Sample some, because y’know, you have to be sure it’s ok.
Peel, core and slice apples and pears into fine-ish slices. Melt the granulated sugar and butter over low heat in a frying pan. When they’re totally liquid, add the apples and turn the heat up to medium. Let the apples and pears caramelize and turn a light brown, it’ll take about 15-20 mins. Stir once or twice to prevent everything from burning. Add lemon zest and transfer mixture to a pie dish. Roll out your pastry (it should be pretty short aka crumbly) until it’s 5mm thick and carefully lay over apples and press down. Trim the edges. Remove and leave to cool in the dish, when warm turn out on to plate and serve with Greek yoghurt. 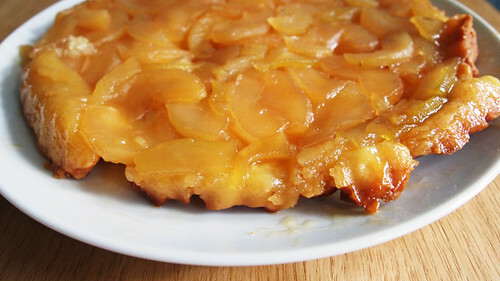 Lordy, I do love a tarte tatin and this one looks fab (loving the fruit mix). Custard or clotted cream, PLEASE. Oh my days that looks nice! @meemalee – what can i say? i have a thing about creamy luscious greek yoghurt…mmmm…. Clotted cream mind you – now that would be sinnfully good. Incidentally i wonder what adding some ground almond to the butter-sugar mix and then plonking some cherries in with the apples would be like? @Oliver – thanks! Easy to make too, with a magi mix the whole thing only takes 40 mins to assemble with another 30mins in the oven. @shayma – thanks! I suspect very few things i cook would satisfy food purists And the Magimix – hand down the most useful kitchen tool i’ve bought since the Global knives and digital scales. Apples and pears – you are spoiling us! But I can only agree with meemalee – Greek yoghurt doesn’t do it for me. Now a scoop of posh vanilla ice cream, now you’re talking! Had a pear tatin on Monday night. I’m a real fan of cream,but I am with you on the Greek Yoghurt it is really creamy and doesn’t taste at all healthy. @Northern Snippet – yay for Greek yoghurt, i’m gad you’re my ally here! It just a piquant edge that lends that extra litte bit of yoghurty goodness. This was my mission before I left. Jen even bought me a tarte tatin dish. I failed. And then accidently broke the dish (which prevented further failures). I might have to give this one a go.